One of the many tasks facing keepers of animals in captivity is how to enrich the animal's environment with new items, challenges, variety, so they don't go barking mad from being in a small space and peered at all day by humans. This lady at the Berlin Zoo who jumped over a wall, a prickly hedge and a fence to climb into the polar bear cage, was just the ticket. And of course the inevitable headlines: Are zoos doing enough to safeguard PEOPLE? Uh, yes. That would be the fence, the wall, and the hedge. She was very kind to help entertain the bear. 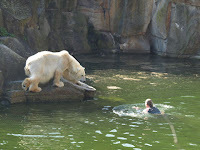 Unfortunately, keepers intervened before she was able to help nourish the bears. what was she planning on doing? snuggle with the cute cuddly polar bears? Survival of the fittest. And she's apparently not mentally fit. Humans can imagine the strangest things when they make eye-contact with animals. She must have thought the bear was inviting her out on a date. Dog: Fit for something, for sure...alas, the keepers were awake and present! Gorilla: Somehow, Cow thinks Gorilla has a lot of experience with women slinging themselves into close Gorilla orbit! Water: so right you are! She was just three feet away from a Darwin Award. Ah yes. Some people do want to be friendly with the wrong animals. It did make for interesting video. Imagine if the bears got to her. That would spoil your trip to the zoo with the kiddies.